NEF: Saamah Abdallah, Sam Thompson, Juliet Michaelson, Nic Marks and Nicola Steuer. With a foreword by Herman Daly. In an age of uncertainty, society globally needs a new compass to set it on a path of real progress. 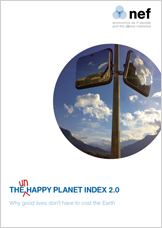 The Happy Planet Index (HPI) provides that compass by measuring what truly matters to us - our well-being in terms of long, happy and meaningful lives - and what matters to the planet - our rate of resource consumption. The HPI brings them together in a unique form which captures the ecological efficiency with which we are achieving good lives. This report presents results from the second global HPI. It shows that we are still far from achieving sustainable well-being, and puts forward a vision of what we need to do to get there. The current economic and ecological crises have discredited the dogmas of the last 30 years. The unwavering pursuit of economic growth - embodied in the overwhelming focus on Gross Domestic Product (GDP) - has left over a billion people in poverty, and has not notably improved the well-being of those who were already rich, nor even provided us with economic stability. Instead it has brought us straight to the cliff edge of rapidly diminishing natural resources and unpredictable climate change. We need to see this current crisis as an opportunity. Now is the time for societies around the world to speak out for a happier planet, to identify a new vision of progress, and to demand new tools to help us work towards it. The HPI is one of these tools. We also hope that it will inspire people to act. "Economists like the concept of efficiency, and the Happy Planet Index is the ultimate efficiency ratio - the final valuable output divided by the original scarce input." - Professor Herman Daly, University of Maryland.